Did you mean BEYONCE? 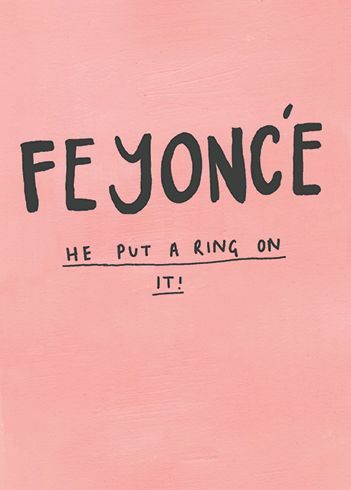 NOPE, we DEF mean, FEYONCE. 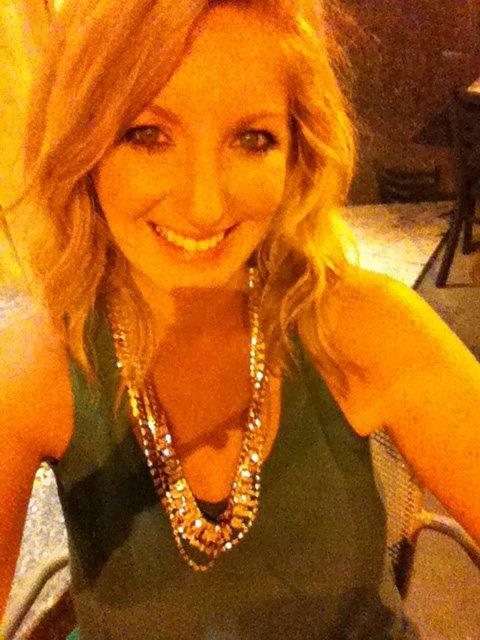 In most cities that you plan on doing your bachelorette party in you can order cookies custom made from a local bakery. Just search on Yelp or on Google for cookies in that area or a bakery in that area. They can hook a sister up with custom cookies. Tell them the date of the party and when you would want them plus of course, the theme and maybe provide some photos plus slogans you would want on the cookies. This could work with cupcakes too! All bachelorette parties need some sweets on hand for late night snacking. Where to buy: Either buy these from a local bakery in the town or city you are going to or we found these cute ones on Etsy and these too. There are a ton of options on Etsy (our fave)- so just search Feyonce bachelorette or Feyonce Shirts and you will find a ton of options. Here are some of our favorites that we found on Etsy for the Feyonce t-shirts. Here are some tank tops that would be perfect if you are going somewhere warm or maybe doing a dancing workout class where you want to wear these. Put a flower crown on to add the touching pizaaaaz. Cute pink FEYONCE shirt here that looks super soft and nice. You could def wear this again and we love when bachelorette party decor or bachelorette party gifts are able to be used again. Who likes spending money for no reason? Not me. Here are a couple of white and black t-shirts that look perfecto for this theme. 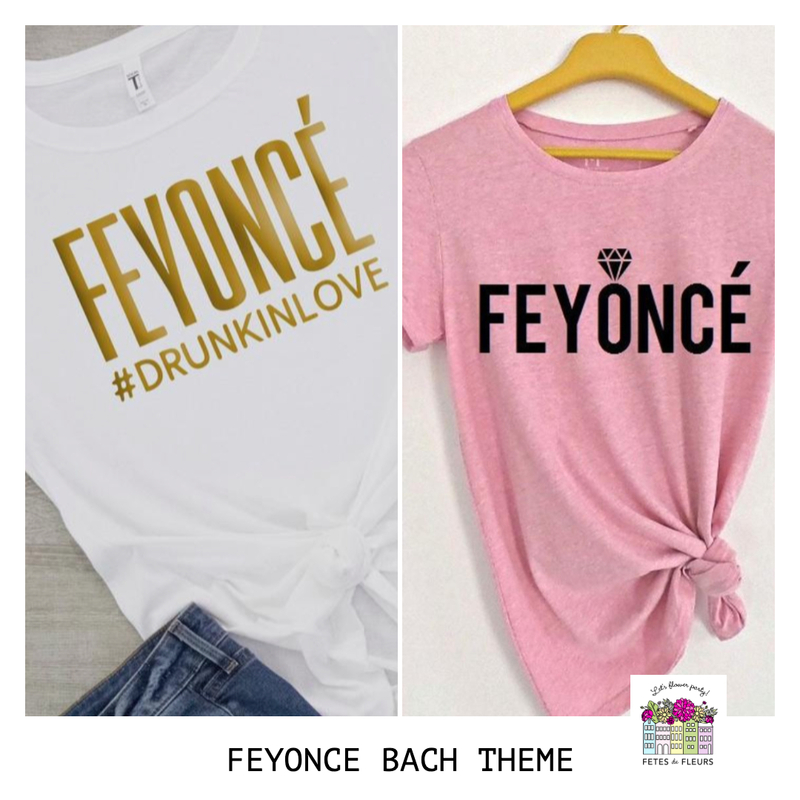 I love that the bride-to-be's shirt says, "FEYONCE #DRUNKINLOVE" and then the bride tribe's shirts would say, "We be all night." Love it. Every bachelorette party needs a HASHTAG with a banner to take photos under or a balloon setup with the hashtag. You have to buy both or have one of these so your bride tribe can take the best photos under it all weekend. 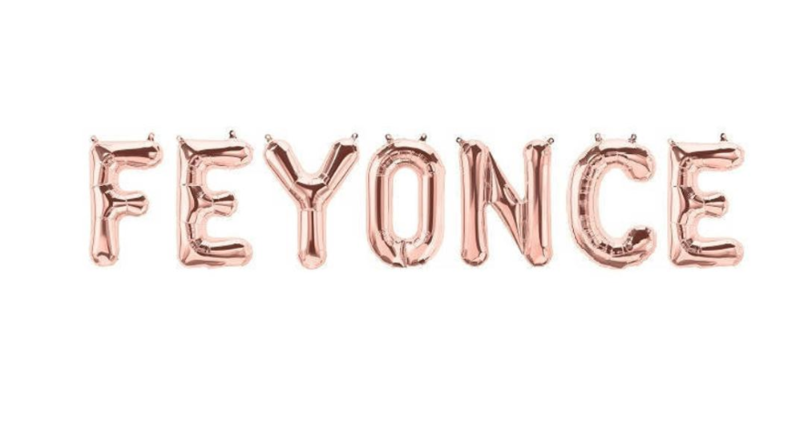 Feyonce balloon banner for $16.50 in rose gold here. Feyonce glitter banner here with different options for colors and size - ranging from $10 to around $20 dollars in. (Also, side note- we are going to start offering add-ons to our flower crown workshops and flower crowns where we can make things like this for you. Think one stop shop for all bach needs but we would def have flowers for this). Coozies - WHO RUN THE WORLD? GIRLS!!! We love love love everything about these coozies here that we found on Etsy. I might just buy these for myself just because I love them. I don't even use coozies, but, hey you can always start something new. 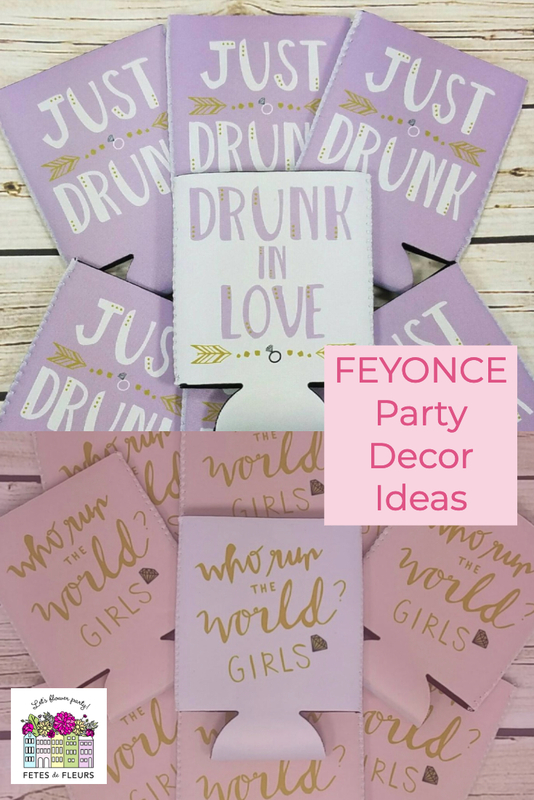 These are perfection for a FEYONCE bachelorette party theme. We also found these "drunk in love" coozies too which are equally as cute. I love when bachelorette party groups have temporary tattoos. These ones that we found are so FUN! I want to wear these just on a normal day to pump myself up to be the badass that I know is inside of me. 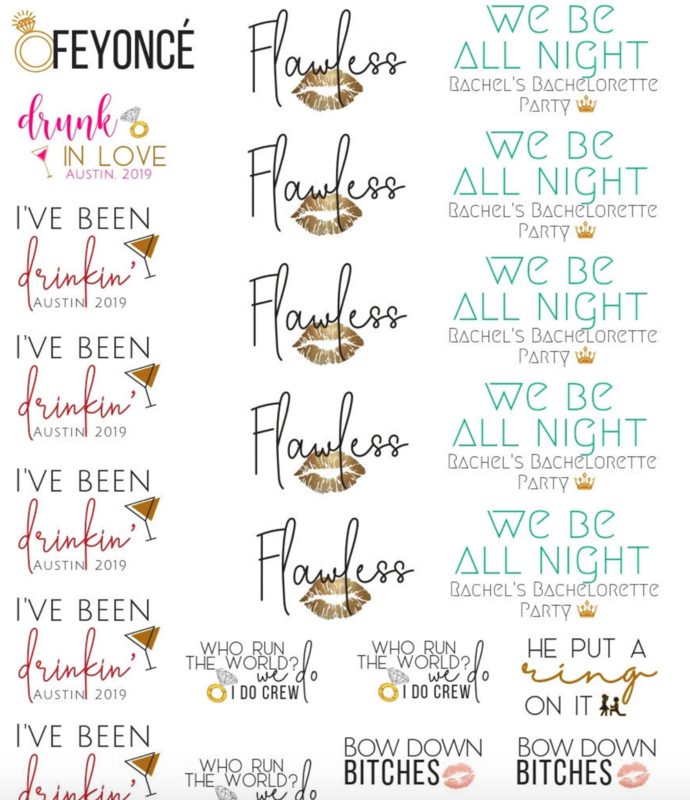 I think are just fab and such a good option for fun bachelorette party favors. Love them all! Can't wait to see bach groups wearing all these fun things and wearing flower crowns to boot. Because let's be honest chicks - to make this complete you MUSTT have a flower crown on your head. To be like the BEYONCE you know you are, you need flower crowns. Well, you are in luck because that is what we do, honey. We have flower party hosts in cities around the US where we host flower crown workshops at your hotel, airbnb or wherever else you decide. We come to you with all of the supplies, greenery, and flowers to teach your bride tribe how to make flower crowns. 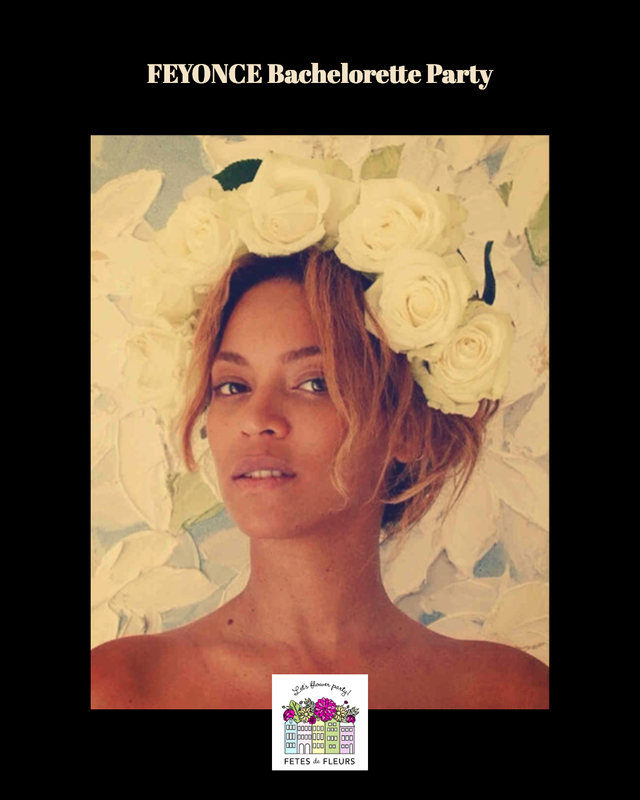 Then you can wear the flower crowns with all these other fabulous FEYONCE things and be fabulous on your bachelorette party! 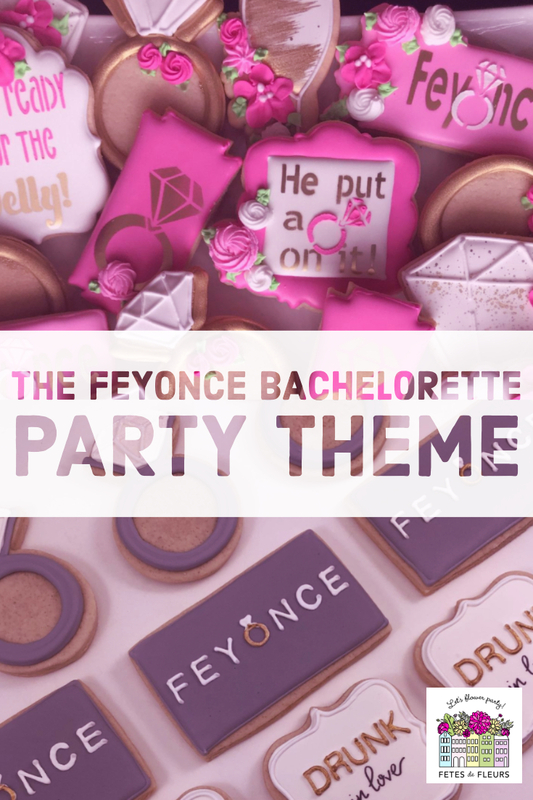 You can check out other fun bachelorette party themes that we have highlighted on our Bachelorette Party Themes Guide here.